This assignment is designed to help you get started using the AWS service called EC2. It will allow you to start a virtual machine in the cloud. You might find this diagram helpful when reading this assignment. NOTE: Remember, you only get one chance to download a private key for an EC2 instance. If you miss it the first time, then the only reasonable choice is to start again from scratch. Figure: Our most commonly used AWS services. Or an [AWS Educate Account][elf-aws-educate]. Once you have an account set up, the next step is to create an EC2 Instance. Step 3, Configure Instance: take the defaults. Save it to Google Drive or someplace similar. Your instance will be assigned a non-permanent public IP address for your EC2 instance. These addresses change ever few days. You can see them in your AWS console, under EC2 instances. In the next step we will replace this ever changing public IP address with an Elastic IP address that will not change. We will need a permanent IP address. On AWS, these permanent IP addresses are called Elastic IPs. Here are instructions on creating elastic IP address. Let's examine these commands one at a time. The second step is detailed in Step 04: Access Your Instance. Permissions 0777 for 'id_rsa' are too open. Your key might not be named id_rsa, but the general solution outlined here will still apply regardless of the name of your key. If you run ssh-add, and you still get the error, then you have loaded the wrong key. 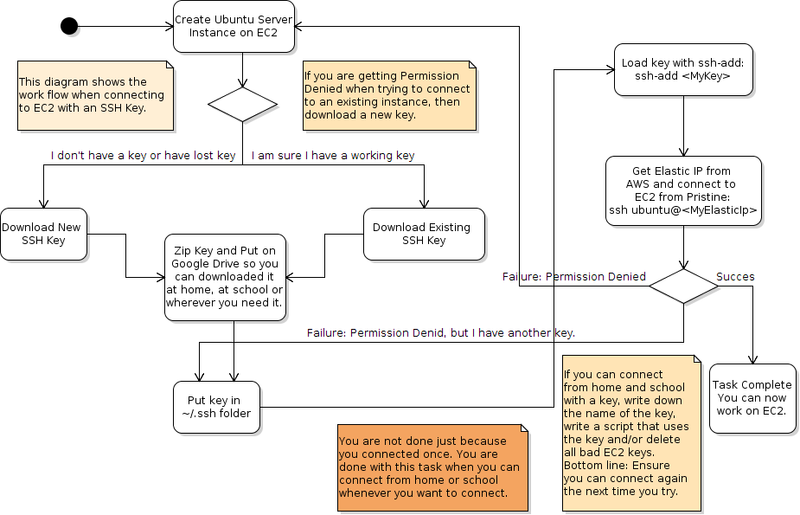 If you have lost your private key for your EC2 instance, then usually you are out of luck. Your only recourse is to delete the EC2 instance and create a new instance. When creating the new instance, be sure to keep track of the key that you download from AWS. In particular, zip up the private key and put it in the cloud, as described above. NOTE: You can add keys to a server by placing the public part of a public/private SSH key pair in the authorized_keys file for your EC2 server. That process is described elsewhere. The point is that you can add one of your personal SSH keys to the server instead of relying on the key you got from AWS. 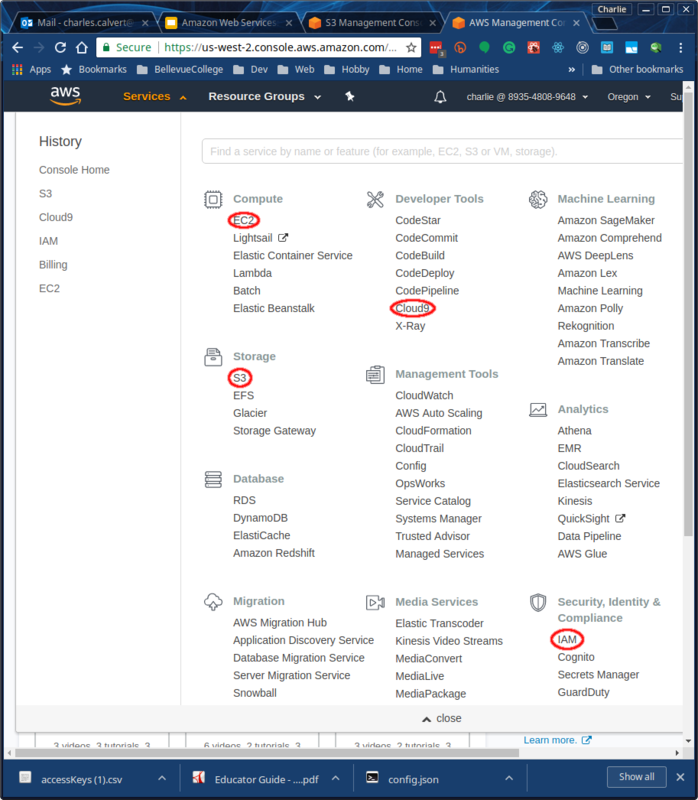 However, you can't add the key unless you have used the AWS key at least once to give you access to the authorized_keys file on your EC2 instance. You can configure your instance by running a script found in JsObjects called UbuntuSetup. Follow the links below to learn how to proceed. This is an aside. You don't have to do the things this way. I'm including it only as an FYI, as an additional bit of information that you might find useful. Code like this will both load your key and begin an SSH session on EC2. Of course, you need to supply your own elastic IP address. In the EC2 Instances page select your EC2 instance. Get the name of your Security Group as described above. Edit and add a Custom TCP rule for the appropriate port. Our most commonly used Ports are 30025, 30026. I believe you can edit the inbound security rules to reserve a block of ports: 30025 - 30030. This will open 30025 through 30030. See also this section on working with CIDR groups and known IP addresses rather than 0.0.0.0/0. To sign on to both machines with a single key we have to put the public part of our Prog 270 (GitHub) key on our Ubuntu instance in the ~/.ssh/authorized_keys file. We then load it and clone our GitHub repository. The second step shown above copies our private key into the EC2 ~/.ssh/authorized_keys file. Note that git@github.com:user-name/repo-name.git is the URL of your GitHub repository. Let's walk through this step by step. First load the key you use to access GitHub. Now copy that key to the ~/.ssh/authorized_keys file on your EC2 instance. We do this by running ssh-copy-id command from Pristine Lubuntu. Of course, use your public or elastic IP address. Now upload the zip file to Google Drive. It doesn't have to be in our shared folder. Just so you can get it at home. Choose New | File Upload on Google Drive. Whether you use ssh-copy-id or scp to put your public key in the EC2 authorized_keys file is mostly a matter of taste. However, the ssh-copy-id program is a bit safer. For instance, it checks to make sure you are not putting duplicate keys in the authorized_keys file. Take a moment to be sure you understand what is happening here. We want to use a single key pair to access both AWS and GitHub. On Pristine Lubuntu we already have the Prog270 key set up to access GitHub. To also use it with our AWS instance we have to copy the Prog 270 public key into the authorized_keys file on our AWS server. Needless to say, we place public keys in our authorized_keys file when we want to grant the owner of a particular private public key pair the ability to access a resource such as our AWS server. If you own a private key, and its matching public key is in the authorized_keys file for a service we want to access, then we are all set: we can access the service. I have loaded the private key with ssh-add or similar tool. If the above are true, then you should be able to access your resource. For instance, you can access EC2 or GitHub. See in particular the first three sections. Take a screen shot of the command prompt and submit that with your assignment. It should show that you have a JsObjects directory. After I have given you a final grade, consider what you want to do with AWS and your instance. Another approach is to buy a relatively inexpensive reserved instance once your year is up. A third option is to push all your code from the EC2 instance, save anything else of importance to Google Drive, and then delete your instance. If you have no running instance, no EBS volumes (hard drives), no elastic IPs then you should have no bill even after the year is up. Check billing to be sure you have deleted everything. You could also stop the running instance, but leave the EBS (hard drive). That is much less expensive that running your instance month to month. You would still get a bill after your year is up, but it would not be particularly large. Never have more elastic IP addresses than you have running instances. You should not get billed for an elastic IP address so long as it is attached to a running instance. If you stop (shut down) or terminate (delete) an instance, be sure to delete the associated IP address or you will get billed. Amazon has a limited number of IP addresses. They don't mind sharing them, but they don't want to waste them. So long as you use them, all is good, but if you just reserve it and don't use it, don't attach it to a running instance, then they are not happy. If they are not happy, they bill you. You should run sudo apt-get update and then sudo apt-get upgrade every few days. Afterwards, you may need to reboot your EC2 instance. It's sometimes a good idea to run sudo apt-get autoremove after this kind of dist-upgrade. This will cause your connection to EC2 to close or freeze. You will need to wait about 2 to 5 minutes, and then try to reconnect to your EC2 instance. Convert the PEM file to a PPK file. Rules with source of 0.0.0.0/0 allow all IP addresses to access your instance. We recommend setting security group rules to allow access from known IP addresses only. 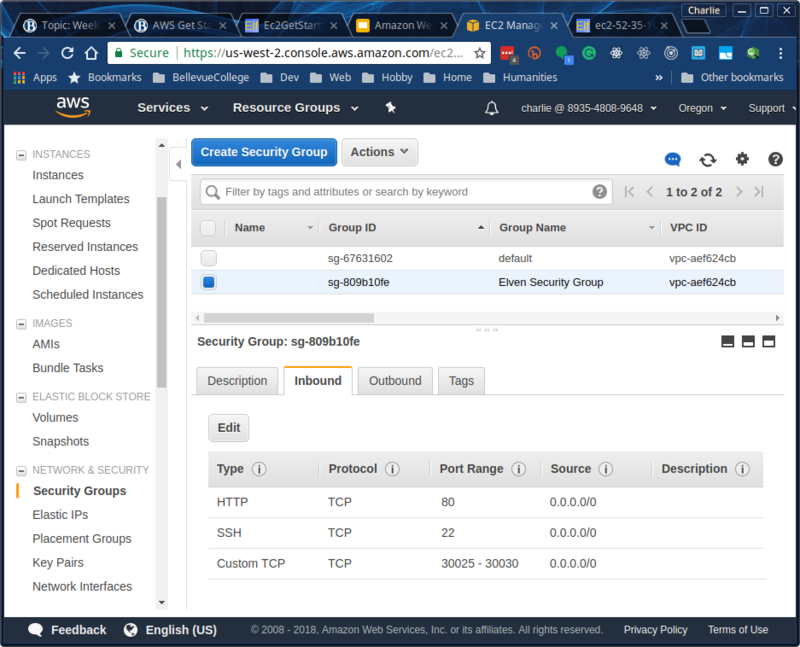 Then I went to AWS and set the source for the SSH address (port 22) in my Security group to the CIDR block from the page linked above. This should mean that only someone with an XFinity account that shares the range of IP addresses that I am assigned could SSH into my EC2 instance, and then only if they had my private key. I ran some tests, setting some bad CIDR ranges and I could not SSH into my box. Then I set some good ones, and I could SSH in.